SECURE AND RELIABLE ENTERPRISE-CLASS SERVICE THAT BUILDS CLOSER RELATIONSHIPS WITH KEY TRADING PARTNERS WHILE PROVIDING UNPRECEDENTED INTEGRATION WITH YOUR INTERNAL SYSTEMS AND PROCESS. BOLD VAN Enterprise strengthens Trading Partner relationships by exchanging unlimited data securely and reliably on a cutting-edge VAN boasting a 99.998% uptime. Our migration process is efficient, secure, and transparent. We will onboard all Trading Partners, following our rigorous, proven methodology. Migrating is a cinch and doesn’t disrupt business. Our reliability and security are founded on over 25 years in the EDI industry. We’ll simplify complexity, you focus on growth. Providing committed and qualified support is a chief principle at BOLD VAN. When called upon, the knowledgeable and experienced support team at BOLD VAN is available and ready to assist. A dedicated and experienced account manager ensures you take advantage of the full spectrum of Enterprise-class features. Enhanced searches, advanced reporting, tighter internal integration and control are only part of the host of innovative features offered at the Enterprise level. Business never rests, neither does BOLD VAN. We are here to resolve any issues 24 hours a day, 7 days a week. Robust relationships, BOLD partnerships. Introducing Trading Partner based pricing with unlimited data has placed BOLD VAN at the forefront of the EDI industry. 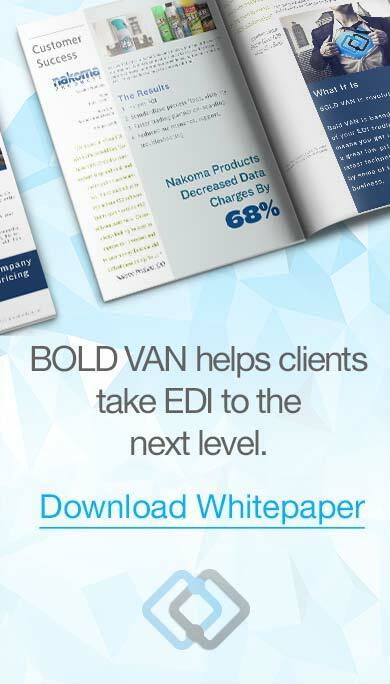 BOLD VAN provides this value with the latest EDI technology and some of the best minds in the business. Nothing is more important than Trading Partner relationships. Enterprises receive dedicated, personalized, available support when partnering with BOLD VAN. Support that resolves problems and provides critical information cultivates better relationships.